The steel industry is hurting, but that just means the winners and losers are sorting out right now. Steel is a building block of the modern world. It gets used in everything from roads to buildings to home appliances. Which is why steel producers around the world ramped up production to meet demand coming out of rapidly industrializing China. Only the expected demand hasn't materialized now that China's growth is starting to slow. That's put the U.S. steel industry on the defensive, and left some of the biggest industry players reeling. If you've been watching the steel industry, heavyweight United States Steel Corporation (NYSE: X) may have tipped us off as to which companies have the best business prospects. U.S. Steel is one of this country's largest steel manufacturers. It's been in business for more than 100 years, and has long been a bellwether for the industry. However, that doesn't mean its history is filled with good news. In fact, it's been bleeding red ink in recent years and it doesn't look like things are going to get better any time soon. In fact, during a recent conference call, CEO Mario Longhi noted, "We've taken aggressive and decisive actions to address the extremely challenging conditions we are currently facing in North America." Obviously, the going is still challenging, and more needs to be done to get U.S. Steel back on course. And this is where things get interesting. U.S. Steel primarily produces steel using blast furnaces. That's an older and more expensive technology. So what? The company announced plans to build an electric arc furnace, a more modern and less costly technology. And CEO Longhi told Reuters that its on the lookout for more opportunities to expand its arc furnace fleet. That's interesting news, and hints at the future for U.S. Steel and the entire industry. Nucor Corporation (NYSE:NUE) and Steel Dynamics, (NASDAQ:STLD) are two industry competitors that base their businesses on electric arc furnaces. So these two are already playing the game that U.S. Steel wants to get into. And a quick look at results shows that it's been a major competitive advantage. For example, Nucor has made money in each of the years between 2010 and 2014. Moreover, it's lost money in only one year in the last decade (2009) despite the fact that steel is a notoriously cyclical business. Smaller Steel Dynamics can claim the same history of success. And the impact of modern technology is notable. Looking at operating margins helps to put some numbers on this. Nucor's average operating margin over the last five years or so is roughly 5%. Younger Steel Dynamics is a little better at around 5.5%. U.S. Steel's operating margin is woeful -1% or so. You get the picture. That old saying, "If you can't beat them join them," seems apt here. And it says a huge amount about the future of the steel industry in the United States. Although it's unlikely that blast furnaces that create new steel from iron ore will go away, electric arc furnaces that make use of abundant scrap metal to effectively recycle steel are clearly winning the day right now. U.S. Steel's move to "join" that trend simply adds an exclamation point to this increasingly obvious fact. If you're watching the steel industry, know that it's rough out there -- particularly for companies using older technology, like U.S. Steel. However, watching what an old industry hand like U.S. Steel is doing gives more than a hint as to which companies are in the best position to prosper today. 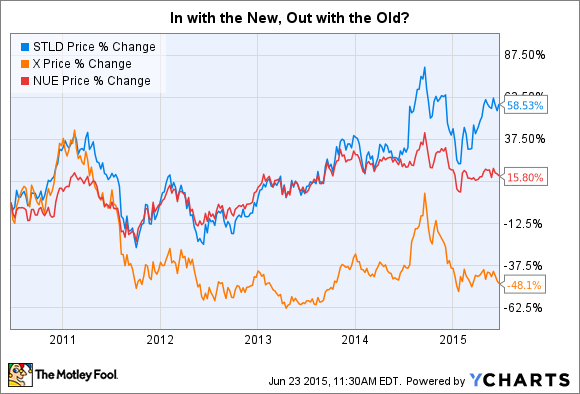 Clearly, Nucor and Steel Dynamics are two such steel makers. That said, U.S. Steel, Nucor, and Steel Dynamics are all worth watching, even if only two are worth owning.